We rent portable staging and party rental equipment in the Atlanta Georgia area. 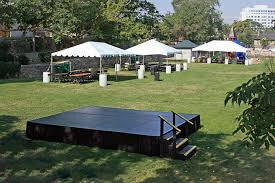 We rent Tents, Tables, Chairs and party rental equipment in the Atlanta, Georgia area. 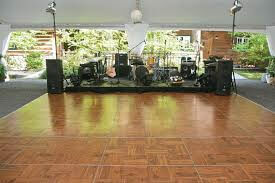 One stop shop for your party rental needs. For head tables, speaker platforms, or performance stages, we offer versatile stages and staging rental systems. 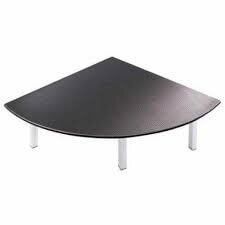 Featuring black vinyl tops, each stage section is 4' x 8' Wenger or 4’ x 4’ Bil-Jax and can be combined to produce larger stages. The height can be adjusted from 15" to 30" high for the Wenger and up to 48” high for the Bil-Jax systems. The adjustable legs are great for rough or uneven terrain. 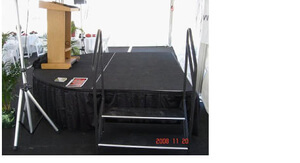 Our staging rentals are great for risers, walk ways, modeling runways, dance platforms, speaking podiums, etc. We also offer stage stairs with hand rails and black skirting. Stages are very popular during the holiday season and especially in the months of April, May and June because of wedding and graduations. Every weekend in April, May and June we will run out of staging. Dark gray carpet (Brand NEW in 2019) or black vinyl top options. Adjustable leg options 15”-30” high. Black skirting, 8' length rental (up to 30" high) $10/ea. Quarter round section, 4' x 4', great for runways. 2 make a semi-circle $45/ea. All Brand NEW Bil-Jax staging in 2019!! Dark gray carpet or black top options. 24” up to 48” adjustable leg options, 1” increments. Stages that are above 30” require guardrails and horizontal or diagonal bracing. Black skirting, 8' length rental (Up to 4' High) $10/ea. Safety guardrail, 4' length rental $15/ea. You can make any combination of 4' x 4' panels to suit your needs.